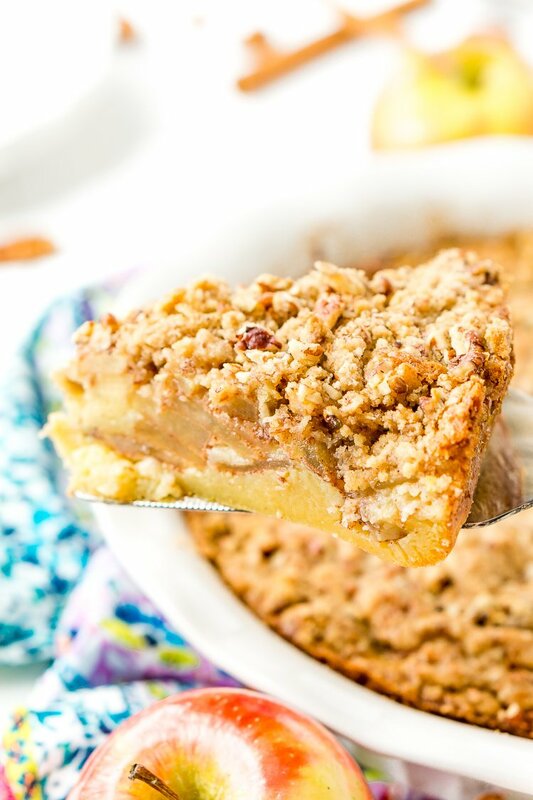 This Impossible French Apple Pie is perfect for people who struggle with pie crust! This spicy and delicious recipe creates its own crust as it bakes! It’s no secret that making pastry crusts can be a pain, but that shouldn’t stop you from baking homemade apple pies this fall! Try whipping up this Impossible French Apple Pie, which makes the impossible possible: you can create the perfect pie crust in a cinch! In this genius recipe, the crust is built right into the filling and forms as it bakes. That’s because there’s a secret ingredient, and that’s Bisquick mix – you can even use my Homemade Bisquick Mix in this recipe! JUST TAKE ME TO THE APPLE PIE RECIPE ALREADY! 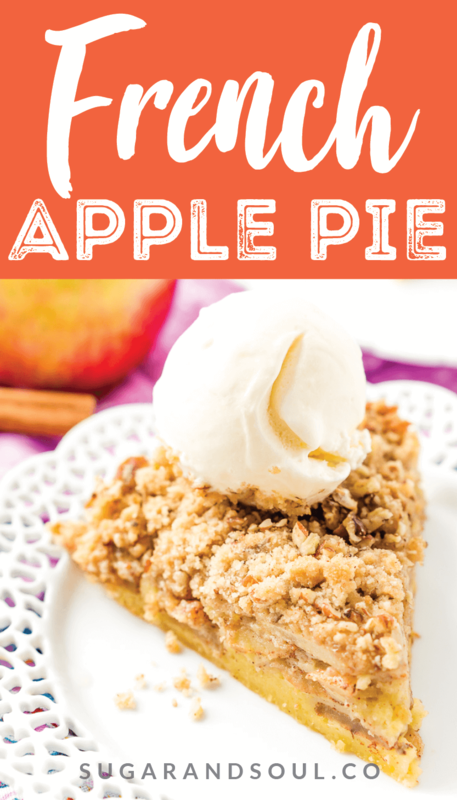 If you’d rather skip my (very helpful, I think) tips and tricks, essential cooking info, and similar recipe ideas – and get straight to this deliciously easy Best Ever IMPOSSIBLE FRENCH APPLE PIE Recipe – simply scroll to the bottom of the page where you can find the printable recipe card. 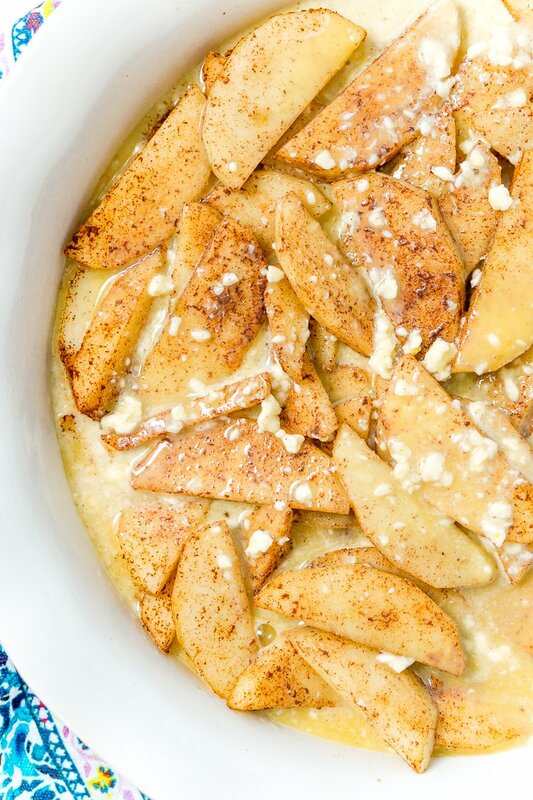 To make this Impossible French Apple Pie, the Bisquick mix is blended with eggs, milk, sugar, vanilla, butter, and salt, then poured over spiced apple slices. Because you’ll use softened butter and not melted, the mixture will be a little lumpy, this is totally normal and it will bake up just fine! 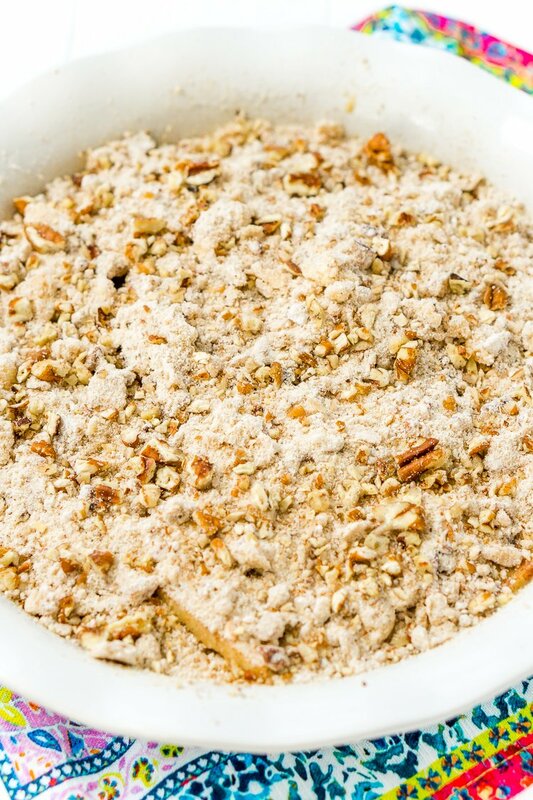 Then, a topping made with more Bisquick, light brown sugar, chopped pecans, cinnamon, and butter creates the irresistible crumble that’s sprinkled on top! As the pie bakes, the Bisquick in the filling makes the bottom of the pie golden brown, resulting in the easiest French Apple Pie ever! What’s the Difference Between French Apple Pie and Dutch Apple Pie? 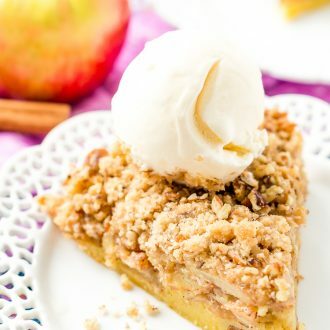 You may be wondering why this recipe is called a “French Apple Pie” as opposed to a “Dutch Apple Pie.” It all has to do with the taste and texture, especially when it comes to the crumble topping. 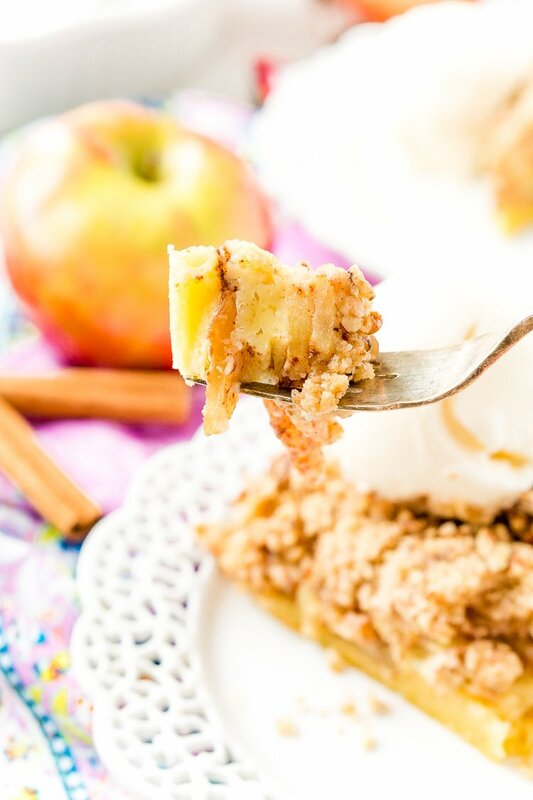 The biggest difference between Dutch and French Apple Pies is that tasty topping! 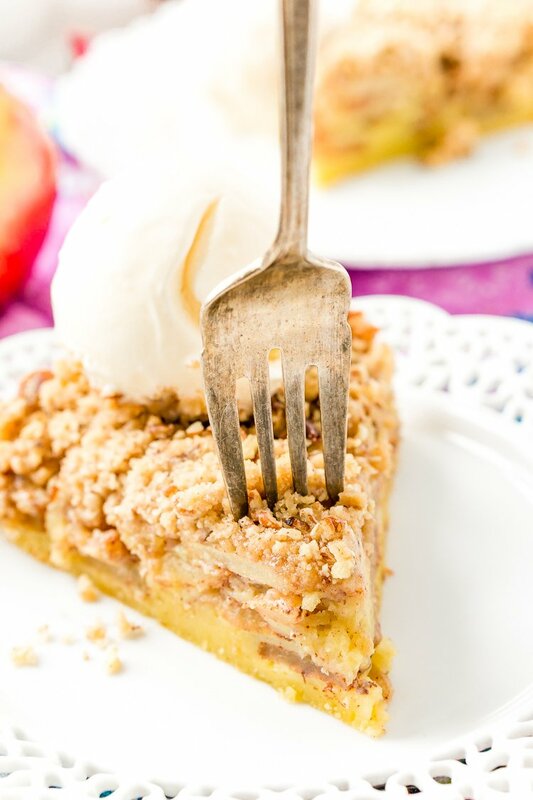 The top layer on Dutch Apple Pie is like a streusel with a bit of crunch (sort of like my Apple Crisp topping) while the topping on French Apple Pie is usually crumblier. In general, French Apple Pies tend to have less sugar than Dutch Apple Pies, with the latter having a more pronounced brown sugar flavor. 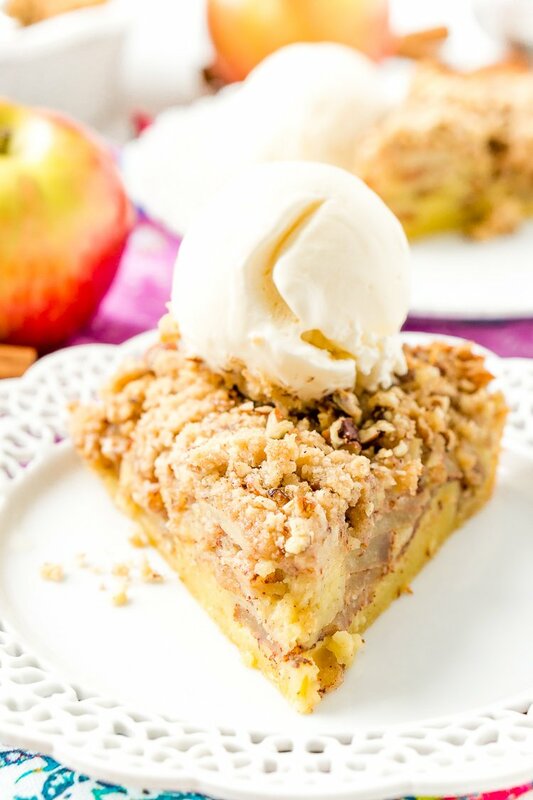 This Impossible French Apple Pie may not be the pie with the perfect flaky butter crust you had in your head, but I promise you it’s still absolutely delicious! Plus it takes way less time and is a whole lot easier in my opinion! 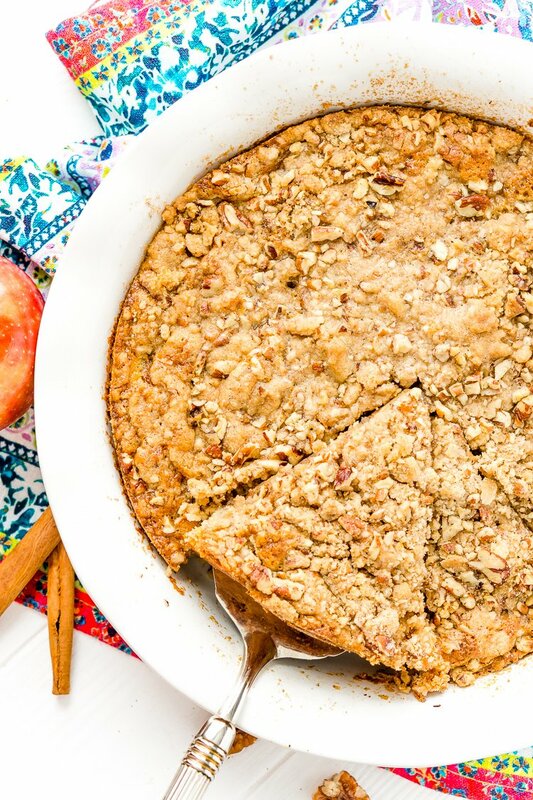 Thanks to this Easy Apple Pie recipe, you can make this family favorite throughout the year. And don’t forget to serve it à la mode with a scoop of French vanilla ice cream or a dollop of Perfect Homemade Whipping Cream! Essentially, an impossible pie is a pie that’s made without a traditional pie crust and as it bakes, the filling creates a crust of it’s own. Generally, this yeilds a soft but firm, pie crust or bottom that is easily sliced and holds together. You might enjoy my Impossible Pumpkin Pie too! 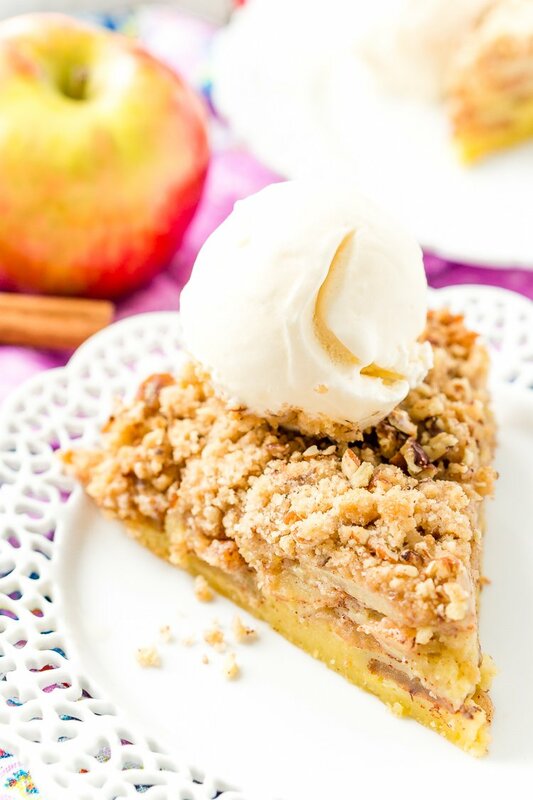 Pin this French Apple Pie Recipe for Later! Preheat the oven to 325 degrees F and grease a 9 or 10-inch pie dish with non-stick spray and set aside. Begin by peeling, coring, and slicing the apples and placing them in a medium bowl. Add the cinnamon and apple pie spice and mix until apples are evenly coated with spices. Add the apple mixture to the prepared pie dish and spread them out evenly. In the medium bowl, the apples were in, whisk together a 1/2 cup of Bisquick mix, eggs, milk, sugar, vanilla, butter, and salt. The mixture will appear slightly lumpy because the butter is softened and not melted and therefore will leave lumps, this is okay! Pour the wet mixture over the apples. In a separate medium bowl, combine the topping ingredients, reserving 2 tablespoons of chopped pecans. Use your hands or a pastry cutter to mix until a crumble forms. Sprinkle the topping over the top of the pie, then sprinkle the remaining pecans over the top of the crumble. Bake for 40 to 45 minutes or until a cake tester or toothpick inserted into the center of the pie comes out clean. Remove from oven and allow to cool for 10 minutes before slicing. Serve with whipped cream and ice cream. Store in the fridge and enjoy within 2 days. If you do not have apple pie spice, substitute with 1/4 teaspoon each of nutmeg and allspice. We prefer crustless pies! First, it’s one less step you need to take and you get to really taste the delicious apples! We topped ours with whipped cream. Yes, I love how easy they are! That crumb topping is to die for – looks absolutely delicious!